Norfolk is a relatively flat area of Britain and has numerous slow moving waterways which have long been utilised by man for both travel and trade. Across the county, with its many waterways, tributaries of the Great Ouse, Waveney, Yare and Bure were used extensively for navigation until Late Saxon times, when many were blocked by the construction of water mills. Later, from the late Middle Ages, artificial cuts (which also aided drainage of the fens) greatly increased navigable waterways in the area. One of the earliest artificial waterways constructed in Norfolk must be that from the River Wensum up to Norwich Cathedral. This was dug before the cathedral and priory were built in the twelfth century, to enable boats to carry building materials right up to the site itself. Records indicate these materials to have been stone from Normandy, iron from Sweden and timber from the Baltic. These were trans-shipped at Yarmouth from sea-going vessels to smaller river vessels, then sailed up to Norwich. The canal was gradually allowed to deteriorate and was eventually in-filled in about 1780. No surface traces remain of it, but trenches have revealed signs of the flint and mortar walled edges (NHER 203). Having said that, after construction of the cathedral and priory was completed the canal remained in use as an important approach to the priory, and a vital means of supply to the many who lived there. It was important enough for an arched gateway to be built in the fifteenth century to guard the approach to the cathedral and priory. This remains, in modified form, and is now known as Pull’s Ferry (NHER 26053). Although the Turnpike Acts (from the 1660s onwards) led to improvement of major land routes (with money raised by local Trusts, and the debt serviced by tolls on traffic), road transport did not provide a satisfactory or economical method of moving goods in bulk. Hence water transport was heavily relied on. This had the benefit, despite often being slow and indirect, of being relatively cheap. From the 17th century onwards, Acts of Parliament were used to raise capital for river navigation improvements, to build locks, embank rivers, dredge and make cuts to existing waterways. Examples of these kind of improvements include the Rivers Nar, Little Ouse, the Bure to Aylsham and the Waveney from Beccles to Bungay. Improvements to navigation had the effect of encouraging industry. For instance, from the 1750s improvement of the River Nar a maltings grew to process malt for export (NHER 3939). Also, the “Aylsham Navigation” (basically the widening and deepening of the Bure) allowed trading wherries to come right up to the existing mill, when completed in 1779 (NHER 7414). This gave a new lease of life to the town, as new businesses (e.g. boat building, coal and timber dealers and masons) were set up to exploit the improved means of distribution. Generally, goods coming into Norfolk were coal, timber, animal feeds and fertilizer, together with consumer goods. Going out were commodities like grain, bricks, and the products of mills, which again benefited from an increase in trade through improved navigation. There were few complementary artificial waterways in the county, and these were invariably constructed as a response to prevailing economic conditions. Generally, the traffic generated by an agricultural county did not justify the expense of canal building. Dilham and <?xml:namespace prefix = st1 ns = "urn:schemas-microsoft-com:office:smarttags" />North Walsham canal showing Bacton Wood Lock. 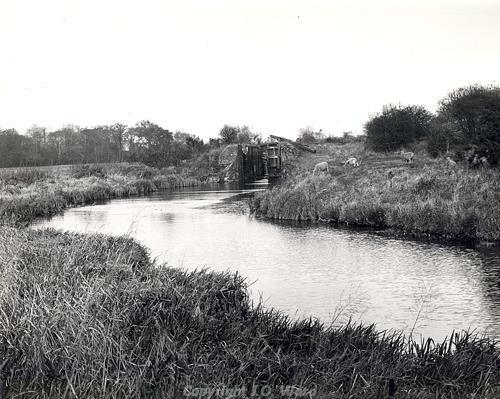 The most important artificial waterway was the North Walsham and Dilham canal (NHER 13534) which linked North Walsham to the river Ant at Dilham. The idea for this appears to have originated as a means of avoiding the fairly high cost of transporting goods on the newly-opened toll road between North Walsham and Norwich. It was also seen as an opportunity to improve turnover at a number of mills along the river Ant. Although the idea to build a canal was decided on, mainly by local landowners, in 1811, and an Act of Parliament authorizing its construction was passed in 1812, the canal was only completed in mid-1826, at a cost of £32,000. Once completed, the system allowed goods to travel from Antingham, via the River Bure, to Great Yarmouth (and of course back). The canal was 10 miles long, dug by hand (by some 100 labourers) and lined with clay. It was served by five locks along its length. A special “cut” was made in Dilham (“Tyler’s Cut”) for access to a brickworks there (NHER 15890). However, the canal itself was narrow, only able to take boats up to 12 tons, and it soon became clear that the volume of trade was too small to be profitable. Even if the volume had been higher, the water supply (from the upper reaches of the Ant) would not have been enough to replace the water let through the locks. The advent of the railway and improved roads meant that, in a short space of time, a cheaper, quicker, and more efficient transport systems were available. After various changes in ownership, the canal fell into disuse in the 1920s. Of the five mills along the course of the canal, Antingham (NHER 15854), Bacton Wood (NHER 11572), Ebridge (NHER 11730), Brigate (NHER 8206) and Dilham (NHER 15892) only Ebridge continued to trade (by road, not using the canal) and now even this has pretty much closed down. The only other attempt to build a canal in Norfolk was the Norwich and Lowestoft Navigation’s “New Cut” from Reedham to Haddiscoe, which linked the Yare and the Waveney to the New Harbour at Lowestoft by 1835 (NHER 40795). This was an attempt by various Norwich based interests to allow sea-going vessels to reach Norwich while avoiding the mudbanks of Breydon Water, and the expensive trans-shipping tolls of Great Yarmouth. It also made Norwich an international port. Not surprisingly, authorities in Great Yarmouth were not taken with this idea, and there was a fair deal of bickering before construction was begun. Once it was, the project was hampered by tidal difficulties and problems with correct materials. As with the North Walsham and Dilham canal, the spread of the railway system rendered the canal obsolete. Also when parliament later authorised the deepening of the lower Yare, and the dredging of Breydon Water, this gave a more direct route to the sea via Great Yarmouth. Ironically, the site for the harbour in Norwich became railway yards for Thorpe station, the canal basin being filled in and now forming the car park at the front of the station (NHER 332). Never having made much of a profit, investors in the project lost over £80 000 when the company was sold in 1842. The British government, who had loaned the company £50 000 to complete the works, lost its money too. Piet Aldridge (NLA), May 2005. Ashwin, T. and Davison, A. (ed. ), 2005. An Historical Atlas of Norfolk. Third Edition. (Chichester, Phillimore & Co. Ltd.). Brown. P., 2002. ‘Norwich & Lowestoft Navigation – Why did it fail?’, Norfolk Industrial Archaeology Journal 7 No. 2, 46-53. Griston, J., 1981. The North Walsham to Dilham Canal (Dereham, Cowper). http://www.canals.btinternet.co.uk/canals/northwalshamdilham.htm, Accessed 5 September 2006. Pierssené, A., 1977. Water Transport in Norfolk (Norwich, Norfolk Museums Service). Wade-Martins, S., 1997. A History of Norfolk (Chichester, Phillimore & Co. Ltd).